While relaxing over the holidays, I had a chance to channel my inner child while playing with my 4 year old cousin. Maddie loves Disney as much as every little girl does, and so it was a treat for me to be able to sit down with her and watch Sleeping Beauty! Sleeping Beauty is my absolute favorite Disney princess movie, and I haven't seen it in years. I love the beautiful movie and scenery, but then also love love LOVE Tchaikovsky's ballet upon which the movie is based. While I may not be actively playing the cello in any ensembles right now, listening to Tchaikovsky's music transports me back to the performances we gave back in the day playing the lyrical and challenging tempos of this great Russian composer. I was a big fan of his pieces, most of which have both melodic interludes and big orchestral finales (read: loud and fast!). Works like Capriccio Italien and Love Theme from Romeo and Juliet give me goosebumps, and they were fun to play, too. Tchaikovsky left nothing behind when he composed the Sleeping Beauty ballet suite, and Disney incorporates the music flawlessly into that gorgeous movie. If you haven't seen it recently, I highly recommend renting it, and tuning in to the soundtrack behind the fun story. Grab your cousin, your niece or your daughter and have fun in the fairyland. 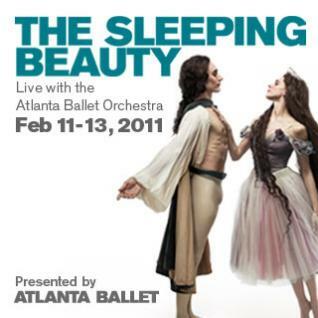 Another option that gets me all fluttery-heartbeat just thinking about it is seeing the Sleeping Beauty ballet live on stage! Cobb Energy Performing Arts Center is offering up just that opportunity, and just in time for the romantical Valentine's Day weekend. Tickets for Atlanta Ballet Presents the Sleeping Beauty start at an affordable $28, and run all Valentine's Day weekend long. They could be paired with pre-show drinks at area venues like Ray's on the River or South City Kitchen Vinings for a fantastic V-day date. Guys, impress your gals with this adorable yet sophisticated (seriously, the symphony is a great date to show the girl you mean business!) option for a night on the town. It's never to early to start planning!